M. Knoedler & Co. Inc., New York. Anon. sale, Sotheby's, London, 23 June 1993, lot 164, where purchased by the present owner. 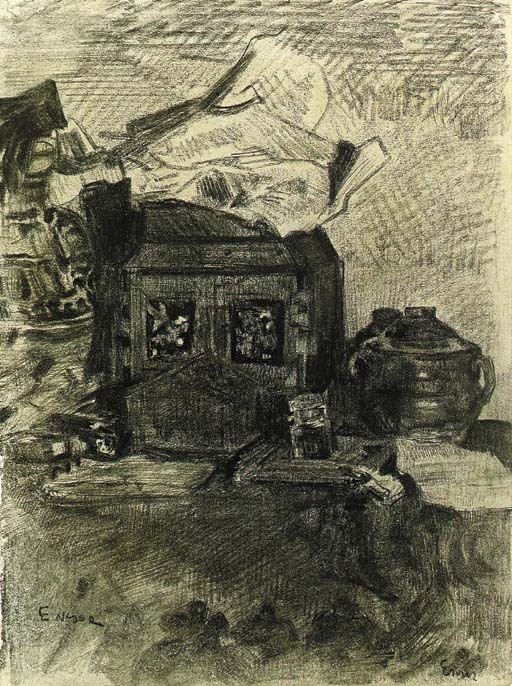 Bruxelles, Palais de Beaux Arts, Rétrospective James Ensor, January-February 1929, no. 77-99. Antwerpen, Koninkliijk Museum voor Schone Kunsten, James Ensor, June-August 1951, no. 41. Tel Aviv, The Tel Aviv Museum, James Ensor, 1981, no. 39. Rome, Palazzo dei Conservatori, Ensor, Dipinti-Disegni-Incisioni, July-August 1981, no. 39 (illustrated in the catalogue p. 64). .
Zurich, Kunsthaus, James Ensor, May-August 1983, no. 163. Sabine Taevernier has kindly confirmed the authenticity of this work.